A vertical crossover bag for a man on his way up, the Airing is a light water-repellent option ideal for dashing around town between meetings. Featuring the signature Red Tag accents, this slick, smart piece exudes capability with organizational features both on the interior and exterior of the bag. Although the bag looks compact and neat, it does have an expandable feature, ideal for those bits and pieces you collect throughout the day. 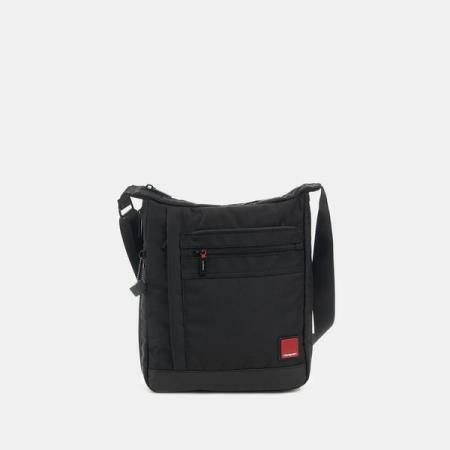 The shoulder strap is adjustable to ensure your absolute comfort while the reinforced base keeps your contents securely contained without the risk of wear and tear. Hedgren began designing bags in 1993 with one simple philosophy in mind: make bags that serve the functional needs of everyday life, and make them look good while doing it. Over the years they’ve grown to realize that functionality isn’t determined by the number of compartments, or pockets, or zippers a bag has. Functionality is defined by the experience someone has while using their excellent bags.